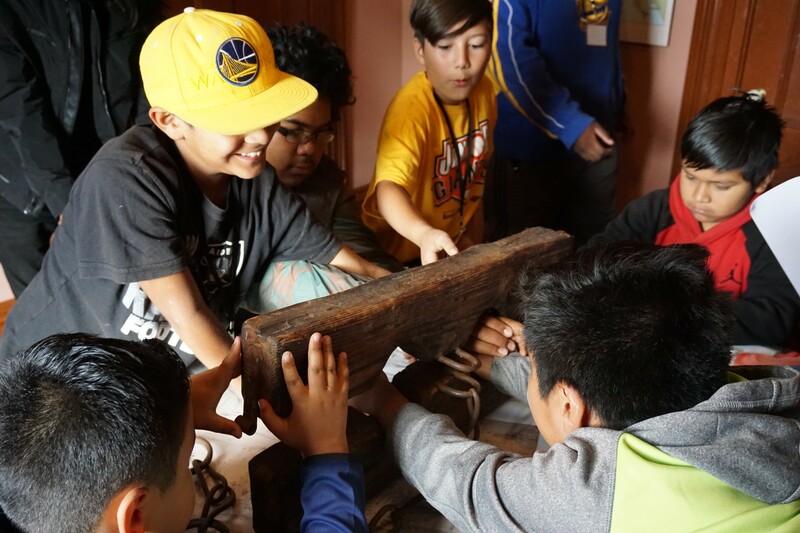 A school group examines the historic stocks at Peralta Hacienda. Image courtesy of Peralta Hacienda Historical Park. A landmark in Oakland’s Fruitvale neighborhood, the Peralta Hacienda Historical Park serves as a community center that encourages people to learn about the neighborhood’s immigrant history. A museum, community garden, event space, and a home to summer camps and teacher institutes, Peralta Hacienda focuses on individual histories and personal experiences, pursuing its vision that “every human being makes history.” And though Peralta Hacienda’s primary audience lives in its neighborhood, the quality of its work has been widely recognized. In 2017, Peralta Hacienda received the National Medal for Museum and Library Service for outstanding service to its community. NEH funding for Peralta Hacienda has helped it develop quality exhibits and provide professional development opportunities for teachers. Most recently, the NEH awarded Peralta Hacienda a $411,005 challenge grant, which has helped it leverage an additional $1.2 million to endow a Director of History position and create the Historic Core adobe area.